Director Susan Marks makes guest appearance at the Lowell premiere of “Of Dolls & Murder,” October 25! Please note: This film contains some graphic imagery and is intended for mature audiences. Yes, our screening of Of Dolls & Murder is a FREE event, but wouldn’t you pay $5-$10 for a great night at the movies AND a personal visit with the filmmaker? If your answer is YES, please click the WePAY icon above and give whatever you can and help us raise $200 in our month long campaign to support filmmaker Susan Marks‘ next film project. The Lowell Film Collaborative will happily MATCH your donation! We’d be so proud to present Susan with a check at the film screening — thank you so much in advance for your support! We continue to be stunned by the fantastic indie film that exists out there, AND the way we connect to it. This time, we give full credit to our dear friend and supporter Junkculture for bringing us together via Twitter with Susan Marks, award-winning filmmaker (The Betty Mystique) and author (“Finding Betty Crocker” and “In the Mood for Munsingwear“). We introduce you now to her newest documentary, Of Dolls & Murder, which we are delighted to say, after much work and planning, is now coming to Lowell on Tuesday, October 25, with director Susan Marks and Gail Batchelder (Frances Glessner Lee’s great granddaughter) in attendance! 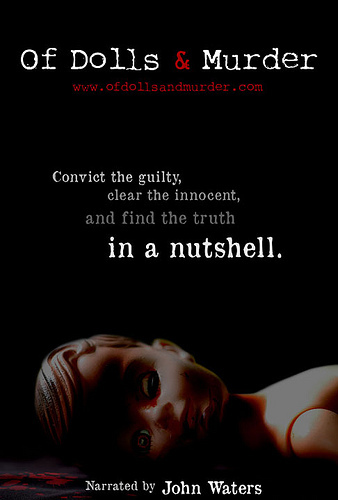 We invite you to take some time and peruse the official site for Susan Marks’ brilliant work, Of Dolls & Murder. What you’ll discover will intrigue and quite possibly haunt you, as Marks takes you on a journey into the brilliance of Forensic Science and one of its pioneers: Frances Glessner Lee. Is that John Waters you hear on the film’s trailer? You bet! The esteemed Mr. Waters is the remarkable narrator who leads us through the world of the “Nutshell” — a miniature and dangerous world created by Lee where heinous crimes are committed. But these Nutshells hold important clues as well, clues that allure and educate today’s top Forensic Scientists and Crime Scene Investigators. What secrets lie inside these beautiful, macabre Nutshells? How did Frances Glessner Lee change the face of forensics over 70 years ago? What important messages do the dead tell the living? The answers to these questions will come soon enough as the Lowell Film Collaborative presents an October screening of Susan Marks’ elegant and groundbreaking documentary, Of Dolls & Murder. Enjoy a peek at the trailer above and JOIN US TONIGHT for this Regional Film Premiere! This entry was posted in Lowell Film News, Lowell Screenings and Events and tagged Crime Scene Investigation, Criminal Justice, Finding Betty Crocker, Forensic science, Frances Glessner Lee, In the Mood for Munsingwear, John Waters, Junkculture, Lowell Film Collaborative, Lowell Film News, Of Dolls and Murder, Susan Marks author, The Betty Mystique. Bookmark the permalink.